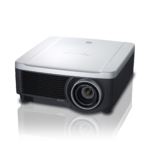 The REALiS 4K501ST LCOS Projector combines 4K resolution, high brightness, and a robust collection of advanced features - all in a compact size, making it ideal for a wide variety of industries and applications including simulation and training, museums and galleries, higher education, corporate, houses of worship and more. Precise detail and accurate colour reproduction are vital to many applications. 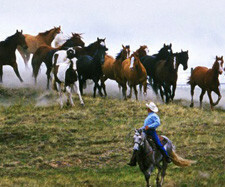 Canon's native 4K resolution (4096 x 2400) produces an image made up of more than 9.8 million pixels. This resolution exceeds both the DCI 4K cinema standard (4096 x 2160) and 4K TV's QFHD (3840 x 2160). At more than four times the detail of Full HD (1920 x 1080), the 4K501ST's resolution delivers extremely sharp images with faithful colour reproduction - creating a highly realistic visual experience. The REALiS 4K501ST comes equipped with a specially designed Genuine Canon 4K short focus wide zoom lens with a consistent F2.6 aperture and throw ratio of 1.0–1.3:1. The lens barrel has a bold red ring which indicates that this lens shares technology with Canon's renowned L-series EF mount professional camera lenses such as an advanced spherical focus feature. The lens itself features a multitude of sophisticated Canon technologies that significantly reduce chromatic aberration, curvilinear distortion, ghosting and flare to create sharp and clear images in a relatively compact projector size. This results in beautiful images with smooth edges. 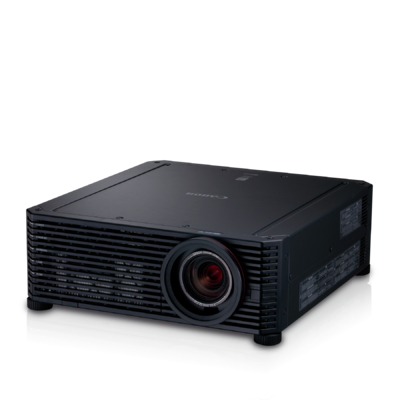 The 4K501ST is the newest member of the REALiS Projector series which all feature Canon's proprietary LCOS (Liquid Crystal on Silicon) Technology with AISYS-enhancement. With LCOS technology, images are virtually seamless with outstanding colour reproduction, and low-latency. 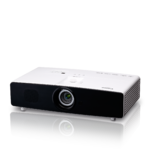 The AISYS engine helps ensure the projector delivers an ideal combination of both brightness (up to 5000 Lumens*) and contrast (with a ratio of up to 3000:1) Upgrading existing spaces to 4K is made easier as this projector is a similar size to lower resolution projectors and can be retrofitted into existing spaces where a lower resolution projector might have been. The REALiS 4K501ST uses Canon's high-speed dual image processing engines to reproduce uncompressed 4K video at up to 60 frames per second (fps), and two upscaling technologies (BiCubic and Canon's proprietary Sharp Trace) working together to maximize the quality of 2K video and other non-native 4K resolution content.Other advanced image adjustment features include Dynamic Gamma and Memory Colour Correction, and a special Motion Blur Reduction feature is available for improved visibility when movement is fast**. Built with an innovative design, the REALiS 4K501ST is compact with a weight of less than 40 lbs. Convenient 360-degree vertical positioning*** and generous Motorized Lens Shift (±60% vertical and ±10% horizontal) provide a high level of installation flexibility. A variety of professional settings and calibration adjustments make it possible to achieve an ideal picture, even in challenging environments. 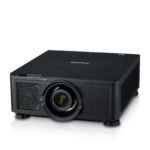 Built-in Edge Blending enables a larger image to be created by joining multiple projectors seamlessly, and a Marginal Focus feature allows for this projector to maintain focus right up to the edges on spherically domed surface. Connections are comprehensive with multiple industry standard interfaces including two HDMI 2.0 inputs and four DVI inputs. Various input scenarios are accepted such as single, stripe and cross configurations. For extra control and seamless integration into existing systems, the REALiS 4K501ST is compatible with Crestron Room View and AMX Device Discovery. Backed by Canon's award-winning Professional Service & Support, the REALiS 4K501ST includes the Canon 3-Year Projector and Lamp Limited Warranty (120 day lamp coverage), as well as an Advanced Warranty Exchange Service Program for further peace of mind. * When in Presentation Mode and lamp is set to Full Power Mode. ** When standing the projector straight up or down, lamp life may be shortened. When motion blur reduction is activated brightness will be affected. *** The REALiS 4K501ST includes a DICOM Simulation Mode. It has not been cleared or approved for medical diagnosis and should not be used for these purposes. Dimensions (WxHxD)W:18.5" x H:6.9" x D:21"
5Supported when "Panel drive mode" is set to "4096 x 2400"
6Network "ON" (Low-power) / "OFF"